My family loves cured salmon on bagels with cream cheese. They enjoy it smoked and served with eggs. But the fresh stuff-- I'll just say this group is a tough crowd to please when it comes to fresh salmon. Well, I love it. So I am always on the lookout for good recipes to keep fresh salmon on the table. When I saw this recipe, I knew it was going to be a winner. Not only is it tasty, it is easy enough to make on a busy weeknight and elegant enough to prepare for a special occasion. The sauce is flavored with fresh lime juice and garlic. Each of these flavors complement the salmon beautifully. 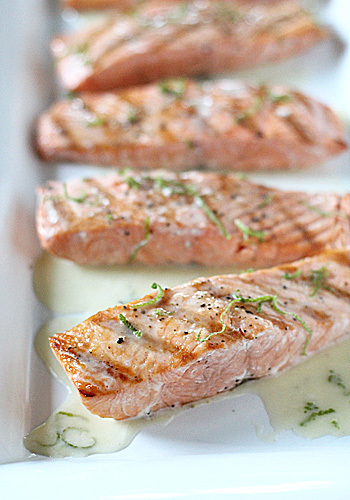 The sauce can be made ahead of time, so all you need to do is pick up the freshest salmon you can find at the market. Grill the fish using the potato tip , then dress it with some sauce and lime zest. It is simple and delicious. I am a bit overdue for a kitchen tip, but I think this one will more than make-up for that. I have read articles about the perfect spatula or fish chamber used to flip fish on a grill. I have read tips about cooking fish on a sheet of tin foil directly on the grill. I have even heard people vow that they will never cook fish on the grill due to the recurring problem of fish sticking to the blankety-blanking grill! . However, once you use this simple method, you won't need any special tools. You can cook fish on the grill again. And you can do so with a Tibetan sense of calm. The secret weapon-- a Russet potato! That's right, a cut Russet potato is all you need. 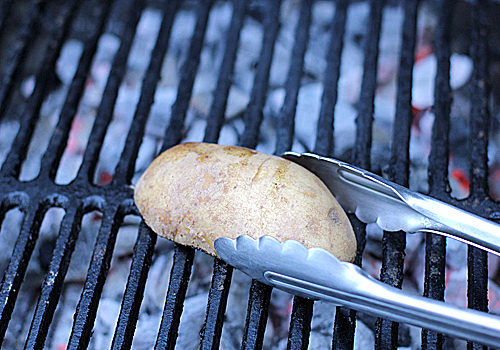 Just before you are ready to place the fish on the grill, give the grill grates a really good rubbin' with the cut side of a potato. I know you are thinking, "How in the world is this going to keep the fish from sticking?!" You see, the starch from the potato creates a film that prevents the fish from sticking. Brilliant! 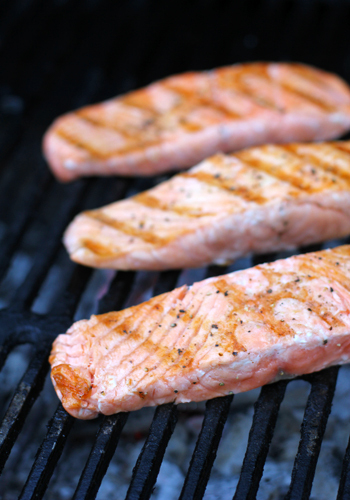 Now, if you want to try out this new method-- stay tuned for the grilled salmon recipe. It's a simple and delicious take on preparing a perfect, pink piece of fish. Oh, don't waste that potato either. Finish cooking it on the grill or trim off the grilled end and throw it in a pot of water and simmer until just cooked through. Then use it in meatballs, mashed potatoes, hash browns, or potato pancakes. Another Sunday and another menu of good comfort food. The featured recipe today is dessert. I have had this recipe for over fourteen years. My first encounter with it was at my bridal shower that was hosted by my then future mother-in-law. I can't remember what else was served on that day, but I have never forgotten about that tart. In fact, I didn't leave the house until I got that recipe. (I still have it on a blue post-it note with old baking stains). Not only is it pretty to look at, but it is pretty tasty to eat. You get all the flavors of a cheese cake without all the heaviness and guilt (o.k., maybe a little). 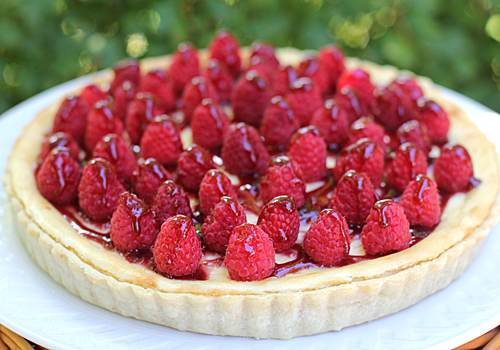 Topped with fresh raspberries and raspberry jam glaze, the combination is superb! Trust me-- once you make this tart you will get asked for the recipe just like I asked for it many years ago. I love smoothies. They are quick and easy, kid-friendly, nutritious, really satisfying on a hot summer morning, portable, and extremely versatile when it comes to ingredients. However, smoothie recipes are ones for which most do not have a precise recipe. They fall more along the lines of "a little bit of this and a little bit of that". I hope this recipe can provide a trunk of sorts that can support many different limbs and branches of ingredients that one might choose for his or her own personalized smoothie. I like to use yogurt and frozen fruit instead of ice (which can water a smoothie down) to achieve that frosty-like feel. This time of year when berries are at their peak in the markets, I buy them in bulk and freeze them for future smoothies. For the berries-- I wash and dry them, then lay them in a single, even layer on a parchment or waxed paper lined baking sheet. I freeze them until solid and then place them in large one gallon freezer bags. For the bananas-- I peel them first before placing them on the baking sheet to freeze. When I am ready to ready to use one, I simply remove it from the bag and slice it with a sharp knife to make for easier blending. 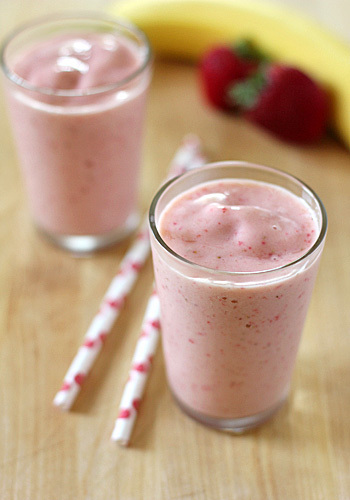 Whether you are sipping leisurely while reading the morning paper ( yes, we still read tree bark in lieu of social media first thing in the am), drinking on the go, or trying to get your children (who are still adjusting to the early morning back to school start) out the door to catch the bus, smoothies are a quick and easy way to provide delicious and nutritious fuel for the body. Well, the crêpe cake managed to cause quite a stir. I realize that an undertaking requiring that level of involvement might be fun to read about but might not make everyone's to-do list. So, for a follow up, we'll go with a dish that might find a place on any number of menus. 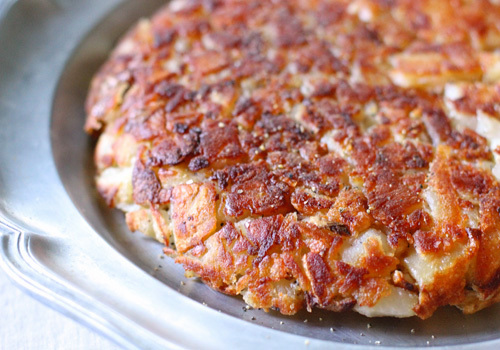 Pommes de Terre Macaire is a traditional French recipe for a large potato cake that is cooked in a skillet and browned in the oven until crisp and golden, a.k.a glorified hash browns. This wonderful recipe comes from one of my favorite chefs, Jacques Pépin. His recipes are of that special category that I dare not tinker with because in my opinion, they are perfection. A crisp and crunchy golden exterior with a tender, buttery, baked interior-- I don't know if it can get any better. Oh, but it can! Top the finished cake with some crème fraîche and Gruyère cheese and you have Pommes de Terre Byron, a.k.a lip-smacking good glorified hash browns! We enjoy this mostly on Sundays, but it does come around during the week topped with a fried egg, or as a base for some sautéed vegetables, or all by its beautiful self with a simple salad on the side. This Sunday marks the last day of summer vacation and the first school night of the school year-- a bittersweet feeling for all. My children played a role in helping me create this back to school menu. It is mostly good comfort food, but with a knock-out dessert. It has been quite some time since I made this cake. In fact, the last time I made it was for my mother's birthday over three years ago. The recipe may seem daunting, but really all it takes is a little patience. A jammed packed summer with three kids will teach one patience, won't it? It was a good summer and I couldn't be happier to make this cake for them. 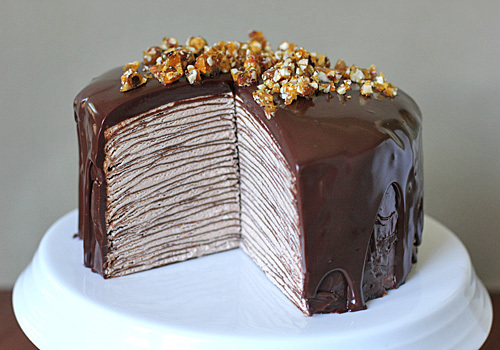 This cake consists of layers (upon layers) of chocolate crêpes. In between these layers is a swiss meringue buttercream that is flavored with Nutella and lightened with a little whipped cream. 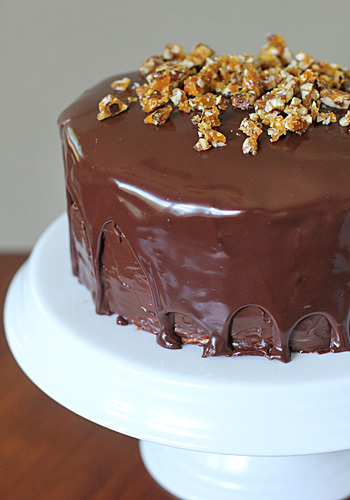 It is then finished with a rich chocolate glaze. When I make the crêpes, I seem to come out with more than originally called for (thirty-nine to be exact). However, I am unable to get all the way to the thirty-two layers for the final cake. I come in between twenty-eight and thirty. That leaves a few extra crêpes for snacking and that's o.k. by me. I also add a bit of espresso powder to bump up the chocolate flavor in the crêpes. The recipe calls for hazelnut cream, but I use Nutella and reduce the amount of sugar. A bit of Frangelico in the filling is optional, but good. Good Sunday comfort food with a decadent dessert and nothing but crêpe expectations for the coming school year! Ooof! Continuing with my love of peaches, here is a recipe I created years ago. I call this a sherbet because, unlike a sorbet, it has dairy in it, but it is just as light as a sorbet, so little guilt is involved. I use the best tasting peaches I can find because that is where the true peach flavor comes from. I add buttermilk for an unexpected tang and use white and brown sugars for a deep, sweet flavor. Fresh lemon juice and spices take this sherbet to a whole new level of frozen goodness. Lastly, I like to add just a bit of liqueur, like peach schnapps, to keep the sherbert from freezing rock hard. With the buttermilk and flavorings, one bite will have your taste buds playing tricks with you. That's right. The taste is ever so reminiscent of that all-American peach dessert, the cobbler. Maybe I should call it Peach Cobbler Sherbet? The extra beauty of this recipe-- no oven required on a hot summer day. Get peachy with it! If I had to pick one summer fruit that I couldn't live without, it would have to be a peach. Growing up in the South, one could smell a peach stand miles away. That sweet floral and fruity scent is unmistakeable. Once at the stand, there would be bags filled to the brim with juicy, ripe peaches. And when I say juicy, I mean "bend the top half of your body and your eating arm forward-running down your arm and drip off your elbow" juicy. Oh, what I wouldn't give to get my hands on a good juicy Southern peach! However, there still are some perfectly suitable peaches grown here in the Midwest. This coffee cake is one we enjoy for a Sunday summer breakfast treat. It is a tender cake flavored with vanilla and lemon zest. The peaches rest atop the batter and a cinnamon streusel is sprinkled on top. 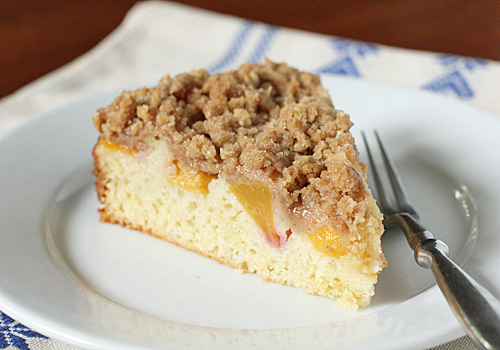 Baked until brown with some peach juices bubbling-- this is one sweet slice of summer. *One note-- make sure you use ripe, but still firm peaches. Keep those extra juicy ones for eating all by themselves. Otherwise there will be too much moisture and the batter will not bake properly. We are spending this weekend with family, so I needed a menu that would feed a crowd. Plenty of shrimp, a couple of flank steaks to be grilled, and some fresh local corn oughta do the trick. With all the strong savory flavors for the meal, a refreshing simple dessert was in order. 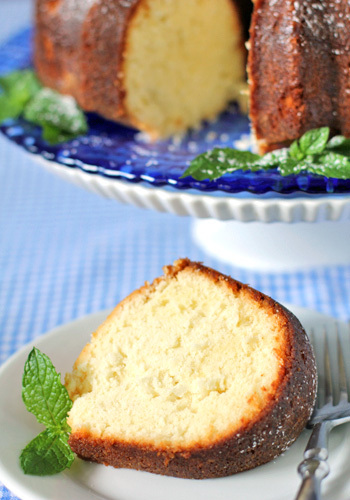 This pound cake is flavored with coconut and lemon. A lemon-mint syrup glaze coats the flavor-packed outer crust. 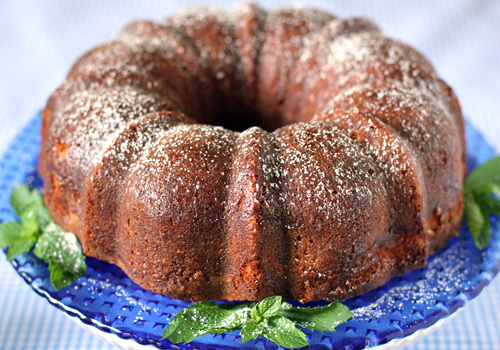 The cream cheese in the cake makes for a rich underpinning of flavor. The glaze keeps it moist, delivering the lemon and mint notes. Served with some macerated pineapple, this is the perfect ending to our Sunday dinner. Regular readers know that we enjoy our Sunday dinners, but we also enjoy our Sunday breakfasts. It is usually a tasty baked good, eggs in some form, and a seasonal fruit or salad. This recipe is one we enjoy during the summer months when the berries and melons are at their peak and the herbs green and bright. It is a simple salad with an extra pop of flavor from the juice and zest of a fresh lime and some fresh mint from my garden. 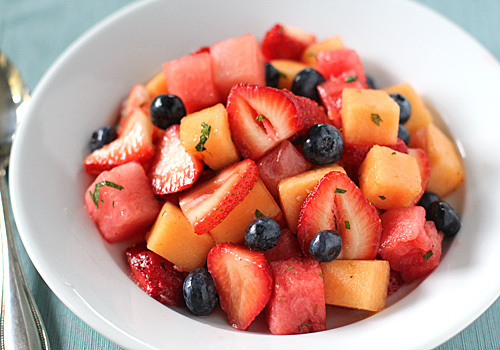 As good as the recipe is as written, feel free to use whatever fresh seasonal fruit you have on hand or enjoy. In fact, I have a few other seasonal fruit salads based on this recipe. Honeydew melon, blackberries, raspberries, pineapple, grapes, and even kiwis are all suitable candidates for this bowl of sweet goodness. I had a few other recipes to share, but after getting a quick picture (and I mean quick because this dessert needs to be assembled and served immediately) and then devouring it after our Sunday dinner, I knew I had to get this one out there STAT with the berries still ripe at the market and my garden. The recipe reminded me of a simple dessert of fresh strawberries dipped in sour cream and rolled in brown sugar that I enjoyed as a child. This dessert takes that childhood treat to a whole new level. The meringues are sweetened with brown sugar (this is a key departure from the usual granulated sugar). Then it is baked and cooled until crisp on the outside with a marshmallow-like texture on the inside. 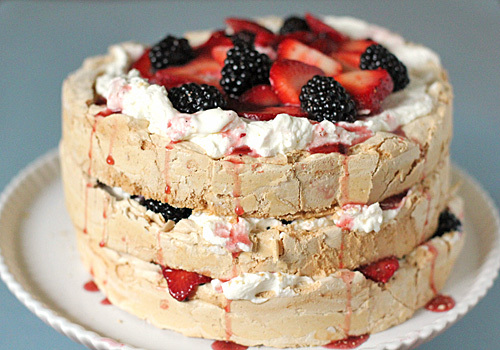 Next, it is layered with juicy berries and a whipped cream mixture; a comb that provides for texture and flavor in every sweet bite. The original recipe called for beating the cream with just sour cream, but I enjoy the tangy flavor of crème fraîche sweetened with a bit of sugar and vanilla. Making the meringues may seem daunting, but really the only tricky part is keeping them dry once baked. First, make the meringues on a cool, dry day. Baking them with the windows open on a humid day will not make for good results. I also like to dry the meringues in the turned-off oven with the door slightly ajar until they are completely cool. That will ensure that they are completely dry. Since the meringues absorb moisture of any kind, this dessert must be assembled just before serving. Leftovers don't save, so make sure you have enough forks at the table to clean up every last crumb. That was certainly not a problem for us Sunday night-- scrumptious! Here is a delicious summer spin on the classic French amuse-bouche. 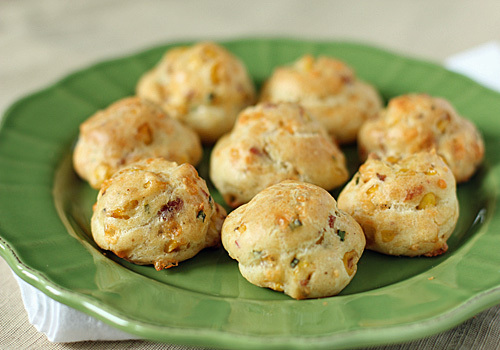 These are gougères or cheese puffs. Gougères are a savory cheese version of pâté à choux. Here they are further enhanced with smoky bacon, sweet summer corn, and garden fresh chives. Use a good quality extra-sharp Cheddar for the cheese and a nice pinch of cayenne pepper for a pleasing kick. Baked until golden and crisp on the outside, but still tender and moist in the inside, these certainly are a "mouth amuser". Big flavors in a small bite indeed. We enjoyed these so much a few Sundays ago that I wanted take advantage of all the wonderful sweet corn in the markets right now and make them again. I love it when I am able to make a recipe simpler than originally written with equally delicious results. This recipe is a fine example. Former subscribers of Gourmet magazine may recognize this recipe from the last August issue ever printed (2009). When I received it in the mail, I knew by looking at the cover that this recipe was a must make. 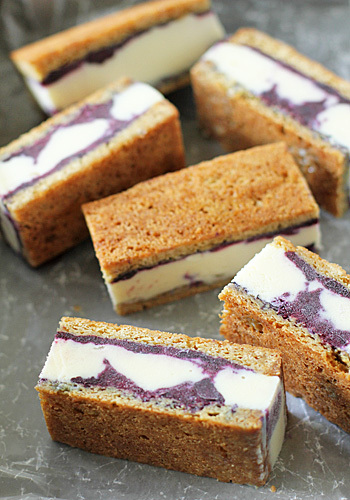 Ice cream swirled with a blueberry compote and sandwiched between soft brown sugar cookie layers-- yum! My problem was certainly not with the end result, but it was the actual recipe breakdown. It called for adding lemon juice and zest to vanilla ice cream and then placing the ice cream in a separate pan and swirling the blueberry mixture throughout. I knew immediately that it would turn out too lemony for my taste and the swirling would make for a blueberry mess with extra dishes. Still wanting a tasty frozen treat that looked as good as it tasted, I took matters into my own hands. First, I omitted the lemon flavorings in the ice cream. Then I swapped out the ice cream for a premium vanilla frozen yogurt. 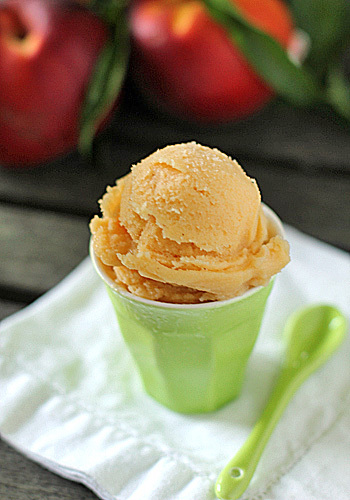 It has a sweet tang and it is lighter than ice cream (better for the swimsuit season!). I made the blueberry compote with lemon juice and lemon zest. I then made the cookie layers with a touch of cinnamon. For assembly, I dolloped half the blueberry compote on one sandwich layer and topped it with the softened frozen yogurt. I dolloped the remaining compote on top of the yogurt layer and then placed the second cookie layer on top. Allow it to freeze for several hours, preferably overnight, so it will slice easily. You'll be rewarded with an incredibly tasty summer treat that is also pleasing to the eye. One bite will send you into blueberry pie à la mode bliss. The one thing I wasn't able to change-- brain freeze! With summer berries at their peak and the weather perfect for grilling, I wanted to share a unique and delicious recipe that uses both. (Wonder Twins Power activate! In the shape of-- Berries! In the form of Grilling Weather! Can you tell what I watched on Saturday mornings as a kid?!) Initially one might think this would be an odd combination, but berries, barbecue sauce, and pork really compliment one another. The chops are first rubbed with a good Dijon mustard and spice mixture that adds great flavor to a rather blank canvas cut of meat. The sauce is made by simmering together fresh blackberries, a little red wine, and some barbecue sauce. The end result is a sweet and savory combo with a tangy and smoky finish from the sauce. We enjoyed these a few Sundays ago, but they are simple enough to be made on a weeknight. 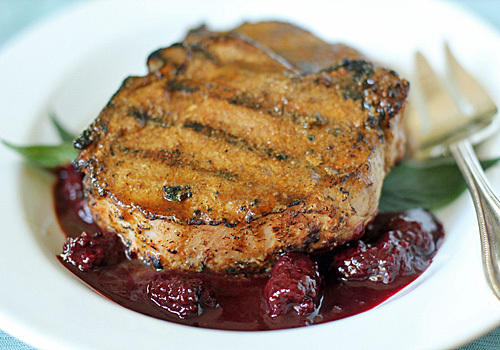 In fact, the chops can be prepared with the mustard and spice rub up to a day in advance. The barbecue sauce can be made the day before as well. The only work left to do the next day is grilling the chops and warming the sauce. The original recipe strained the berries from the sauce, but I like to keep the plump jewels in for taste and texture. I also like to use my own tomato-based barbecue sauce, but any quality bottled brand will do. Garnished with a few fresh sage leaves from the garden, this is a delightfully seasonal dish.